Lately we’ve been hearing from potential clients who have been asked to accept purchase orders from their customers in an electronic format. Very often these potential clients begrudgingly accept that they need to do this for their large (sometimes largest) customer. There are always two sides to the equation, so let’s explore what electronic documents are and why they not only beneficial to you as a supplier, but also to your customer. We’ll also explore how to turn a one-time request into a potential opportunity to grow and expand business as a supplier. Why does your customer ask to transmit orders electronically? Electronic order transmission isn’t a new phenomenon, it’s been around for over 30 years. Electronic order transmissions started with EDI (Electronic Data Interchange) and primarily was used by the manufacturing, transportation and grocery industries. Over time EDI expanded into many other industries as encryption standards were made available to secure EDI transmissions. In 1999, Ariba developed cXML to be used by procurement systems to communicate and exchange documents. cXML is based on XML, but provides specific schemas for each document or transmission. These schemas allow the recipient to validate the document without the system seeing the format prior to the first transmission. 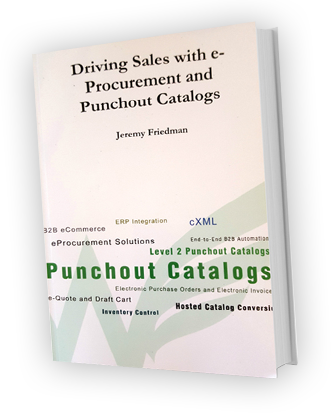 The standard includes many eCommerce features including PunchOut as well as many of the documents exchanged in older EDI standards (such as order confirmations and purchase orders) as well newer formats such as electronic invoices. When your customer requests to transmit orders electronically to your organization you may think, “I already receive orders electronically via my website/PDF/email/etc.” Let’s explore why each of these methods and compare them to cXML. If a customer submits an order on a website, they know the order was received, but the still have to manually enter that into their procurement system. Especially if you are a new supplier, your customer may need W-9 certification and certain approvals to get things setup on their side. They also don’t know if the order has been submitted with a PO # from their procurement system other than referencing an email confirmation. Now let’s look at some challenges with sending an email with a PO attached. Your customer needs 10 boxes of paper clips, 3 boxes of pens and 6 boxes of tissues. They fill out a requisition, get it approved and then click send so the PO goes to the email address you gave them. The PO goes out via email, but for some reason it gets blocked by your spam filter. They have no way of knowing when the PO was received by you or not. If you’re not expecting the PO to arrive, you may not check your spam filter for several days. So how does the emailed PO or website order submission differ from something like cXML? Let’s continue with the example with the paper clips and pens, but this time they create the requisition in their procurement system. The order is created and when ready they click send, but because you are setup with cXML purchase orders the order is converted to cXML and then sent to your cXML order manager which in turn reads the PO as it is sent to make sure it has all the information you need and then responds to your customer saying “Yes, we accept this PO.” Not only do they know immediately, but more importantly their procurement knows the order was sent successfully. Organizations using procurement systems want that full visibility. They don’t just buy paper clips and pens from you, they make hundreds or thousands of different purchases across multiple departments with potentially thousands of users. Let’s get back to your first customer that has asked to send you cXML POs. To start accepting cXML POs you may require a cXML gateway system (such as our e-Procurement Hub). You might also need some integration work if you’d like the purchase orders to import directly into your own ordering processing system. Obviously there are a lot of moving pieces involved; your system, your customers systems, and cXML gateway all need to talk to each other with potentially 3 different teams involved. Knowing all of this, where do you get started? The first step is to identify what information your customer is capable of sending. The good news is cXML is a standard so most organizations send the same data. There will always be a PO #, there will always be a line for each item ordered including part numbers and quantities and prices. The bad news is where information is sent can vary. For example, some organizations send the name of the person who ordered in Deliver To line in a PO; others do not and instead send the person’s name in the first ship to line. Other stumbling blocks include custom accounting codes that may be required to send an invoice or a department code that needs to be mapped so you know which items to send (such as an embroidered shirt with a department name). Now that we know the requirements, let’s talk about the implementation timeline. Your customer may want to start sending you purchase orders by the end of the week (which may or may not be possible of course! ), but as long as you give them a reasonable timeline they’ll be very pleased. In our experience implementation can take as little as a few days to as many as a few months. It’s important to lay out who does what, what the testing plan is (how many test PO’s can be sent and when?) and what the desired go-live date is. If you set a timeline at the beginning then all you need to do is work backwards from that date to see what you can do. We always encourage people to fulfill all the customer requirements first, then worry about your requirements. Once you are receiving the cXML PO’s, even if you have to manually import them for a week to hit the deadline, that’s usually more desirable from your customers’ standpoint since that only affects your side, not theirs. Full automation can always come later. Now that you’ve gone through the process of implementing cXML purchase orders for one customer, how do we turn this into an opportunity? You have everything setup so adding another customer is incredibly easy. You already know the process, have a cXML gateway in place, maybe even some automation to import purchase orders directly into your financial system – so now let’s leverage this system and all the work you put into it. Now is the time to start identifying potential customers that may have a similar need. A smaller customer that only orders 1-2 times per month from you may greatly appreciate the ability to send you orders automatically via cXML or EDI or XML. It can help turn them into a customer that order 10-20 times per month simply by making it easier to submit orders to you. Another place to look is if you have employees that key in orders for 4 hours per day, look at that process and inquire if the customer would be willing to send you data electronically. It never hurts to ask. If you are interested in learning how our e-Procurement Hub fits into the equation, give us a call and we’ll setup a time to chat.